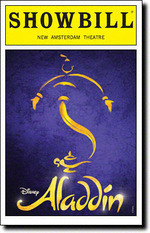 Aladdin, a poor street kid who falls in love with a princess, is imprisoned but discovers the secrets of a magic lamp. Based on the 1992 Disney movie. Based on the much loved animated film, Aladdin tells the story of a street-smart commoner whose entire life changes with one rub of a magic lamp. The scenes with the Genie are fantastic, but the show drags in between them. The songs added to the show are rather dull, and the human replacements for the animals are rather annoying. The show is absolutely FANTASTIC! The genie brings the house down, the songs are unbelievably fun, and all the actors and actresses are AMAZING! The crowd gave standing ovations multiple times! I CANNOT RAVE ENOUGH ABOUT THIS SHOW!